Christmas Eve restaurants of the best. Christmas eve restaurants in the Canary Islands didn't exist in the past. Only hotels were an option. Now since 2015, you can eat out in different ways on the night of December 24. However, always confirm with such restaurants. Often they stop serving Christmas Eve dinners to the public due to sudden family objections. Kindly check with its Facebook page every year, as this restaurant may be closed on December 27. We were dining at Mil Sabores after the 25th when we learned about their Christmas eve dinner. Needless to say is that their doors were also open on the following day. By the way, one of their charming waiters spoke fluent English, French, Dutch, German and Spanish. Depicted is a delicious, peculiar Mil Sabores dessert which my daughter tried. I heard the first time about this restaurant, more than 2 years ago. At that time, my bank consultant praised the duck which is served at this high end Ranilla eating house. 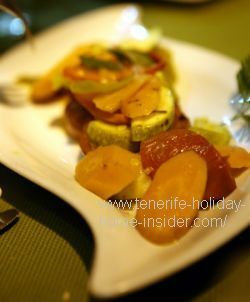 The Thai Cuisine of the Oriental Restaurant of Hotel Botanico Puerto de le Cruz is available for Christmas after dark but may stop serving after 8 p.m. Restaurants of the Realejos theme park of the monks serve Christmas eve dinners. They are followed by champagne breakfasts next to a Christmas tree and garlands. A holiday home in Tenerife offers the possibility of self catering. However, that doesn't mean that everybody feels like cooking after a day on the beach or in the mountains on Christmas night. Besides, singles often don't feel like spending Christmas Eve all by themselves in a studio or apartment. Staying at Toscal Longuera or La Romantica 1 or 2? They are establishments whose owners are not Christians. Most are Asians and often North Africans. Their cuisines are usually open on all Christmas days. Therefore, Christmas is also a time to sample Thai, Moroccan, Libanese or even Mongolian besides Chinese dishes. 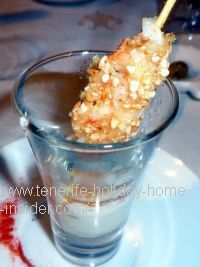 From Christmas Eve restaurants back to Tenerife restaurants.